More than just a legendary player......picture provided by 'Mutchy'. A week and a half ago, we launched our new Player Q and A, with John Richards offering revealing insights into the long goal-grabbing segment of his Wolves career. Here in part two, the former striker concentrates more on his years as the club’s managing director. 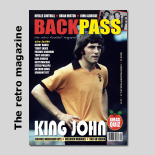 A: To put the record straight regarding my career and the dates…….after leaving Wolves in 1983, I played for the Portuguese team, Maritimo, on the island of Madeira. I took up a position with Wolverhampton Council in January, 1986, a few months after returning from Madeira, and stayed there until 1992, when I moved to Cannock Council, and subsequently became MD at Wolves in October, 1997. I had become a non-executive director at Wolves in 1994, which is what may have caused your confusion over the dates. The simple answer to your question is: no. It never even vaguely crossed my mind to try to become a manager. It just didn’t interest me. I have friends who went into coaching and management (such as Kenny Hibbitt and Mike Bailey) but they had a natural passion for the game and the ability to read how a game was being played. You could see it even in training. They would be the ones directing the play and telling players what positions they should be taking up. I didn’t have their desire or ability in this respect. Even now, I have no particular urge to go and watch a game of football – there are many more things I would prefer to do. The other big factor is the uncertainty of the management profession. Managers and coaches at all levels of the game are sacked on a regular basis and that’s not ideal if you’re the sort who prefers a settled family life and to set down roots. A: No to both questions. When I took on the position in 1997, the club were in an entirely different situation to the previous few years. There wasn’t unlimited money to spend and they were making significant annual losses. Sir Jack, understandably, wanted that trend stopped. It meant having to cut back in many areas and starting to live within our means. Some fans don’t like to hear that message but I like to think the sensible majority realise that spending more money than you are actually earning, year after year, is a recipe for disaster. It wasn’t an easy time and there were even some fans who criticised Sir Jack and questioned his commitment to the club. It’s ludicrous to think that was the case but it happened. Actually, my relationship with the club and the supporters couldn’t be better. In the last month, I have been fortunate and honoured to be inducted into the club’s Hall of Fame and have also enjoyed two wonderful social events hosted by the London Wolves Supporters Club and the Daventry Dun Cow Wolverhampton Wanderers FC Supporters Club. Three fantastic evenings which I’m still recovering from, in fact! 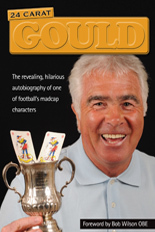 Kenny Hibbitt - a great provider and natural reader of the game. A: As you can imagine, this isn’t the first time I’ve been asked this question – and there’s a simple answer. The decision taken was to have the money in the bank today, rather than hope for money that may or may not come tomorrow. We needed to strengthen the team but there wasn’t any money available to buy players without selling first. The more money we could generate for the manager, the more team strengthening he could do immediately. Only two clubs put in bids in the region of what we were looking for – one was for £5.5m with the possibility of a sell-on fee (generally 10%) and the other was from Coventry, who offered the straight £6m. I might add here that there was one director ready to let Robbie go for around the £3 million mark but, fortunately, he was in the minority. And please bear in mind that any sell-on fee only relates to the difference in the buying and selling prices. Therefore, when Robbie did move from Coventry for £11m, the lower offer with the sell-on clause would only have generated Wolves an additional £0.55m, just £50k more than we got anyway. Of course, there are other unknowns, such as the other club never selling, in which case Wolves would have received nothing, or Robbie getting a serious injury. To be honest, it wasn’t a difficult decision to make. The manager immediately had £6m to strengthen his team rather than £5.5m. It was a simple case of ‘a bird in the hand is worth two in the bush’. A: I would have loved to have gained more full caps for England but, in all honesty, I don’t think I was quite as good as some of the other English strikers around. I’d done my apprenticeship in the under-23s, so the manager and coaches knew my capabilities. The game I played, against Northern Ireland at Goodison, was a disappointment. Yes, I was played out of position on the left, but I don’t think I did myself justice. After that match, I went on tour with the England team and was hopeful of having another chance, but others such as Keegan and MacDonald gave better showings, so, together with Chivers, Clarke and Channon, England had more than enough strikers to choose from. The following season, I was dogged by a pelvic injury, which limited my chances with England, and then I started having problems with my right knee which led to two operations in 1976 within the space of four months. After that, it was always difficult to get back to the same level of performance. I’d had my chance and, unfortunately, never took it. A: There are lots of questions about the Doog, understandably so considering our playing partnership. Here’s the story: From a playing point of view, I couldn’t have wished for a better partner to help me develop into the game. He protected me a lot on the pitch, he took most of the knocks and we went on to be, arguably, one of the best strike partnerships in the game at that time. It was a natural synergy, with brilliant support from players such as Mike Bailey, Kenny Hibbitt and Dave Wagstaffe – they provided us with the ammunition to fire. Off the field, Doog and I hardly socialised. You have to bear in mind, when I first got into the team, Doog was an older married man with kids. I was a youngster dazzled by the bright lights of Wolverhampton (called the Lafayette). We had nothing in common. I used to socialise with Hibby, Paul Walker, Geoff Palmer and John McAlle while Doog mixed with pals of his own age. It is a misconception that because you play in a successful team, you are all pals. There were many disagreements and some fierce rivalries, I can tell you. It happens in any dressing room and, I suspect, that’s the same even now. With regard to the Bhattis, I would like to think Derek was misled by them. 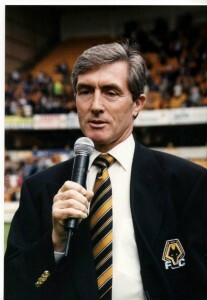 There is no doubt he would have done everything possible to help Wolves but, without the financial support to manage the club, there was probably very little he could do. It was a difficult time for everybody involved and, in hindsight, I suspect Doog and the other local directors wish they had never got involved with the Bhattis. A signed picture of The Doog. A: It’s interesting, Marvin, how things can become distorted over the passage of time. Derek and I did not fall out because, to use your phrase, ‘he effectively forced me out of Molineux’. That scenario wasn’t even a remote possibility. 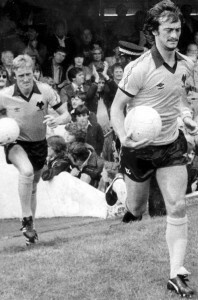 When I left Wolves in 1983, I still had two years on my contract, so I could quite comfortably have stayed and neither Derek nor the club could have done anything about it. 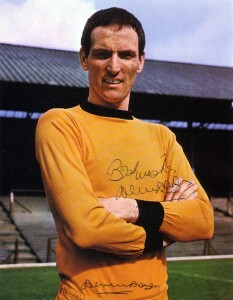 Most players know when they are coming to the end of their playing days and my decision to leave Wolves was based purely on the fact that I wanted to finish my career playing in somebody’s first team, not idling about picking up my money in the reserves. It had nothing to do with Derek. In fact, my fall-out with Derek occurred after I left Wolves and when I was playing in Madeira. It’s on record what the fall-out was about, so I don’t feel the need to keep repeating it. Posted on: Sunday, January 31st, 2010.